Have you been looking for new ways to promote your new blog and posts? Do you want to interact with other bloggers on social media or you want to create awareness for your products, business and services? Then chances are; you will find this post extremely helpful! Lately I’ve been trying to go a little deeper into sharing my blog and its contents in social media communities and truth is, the result from Facebook groups has been tremendous. There are so many groups on Facebook targeting people of various interest and works of life. Good news is these groups can actually skyrocket your website when you promote in them. Facebook communities are currently getting more popular as each day goes by and the traffic you stand to get from them will leave you in awe. These groups are essentially perfect for you and I as startups! 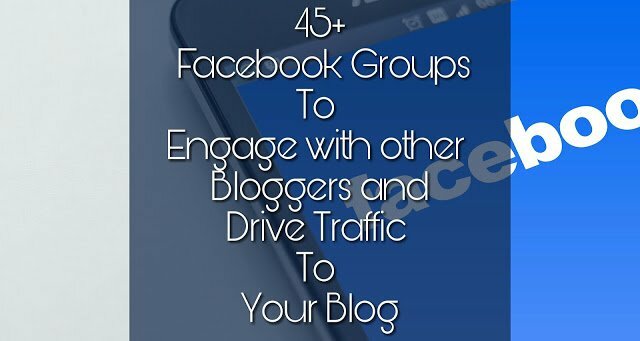 Below are 45 Facebook Blogging related groups that you can join and participate in. Join all or make a choice, but be sure to adhere to the rules and guidelines of each group if made available. Not possible to post on wall but engaging threads are created for that. 36. Bloggers Share & Engage!!! Interactive and user engagement threads. You should know the types of groups that operate on Facebook (close, public and secret), their limitations and rules! Most groups will let you post at any time in a day, while some will specify days for promotion and a few do not allowing posting and promotions at all (doesn’t make them totally useless, you can still learn 1 or 2 things by being part of these groups, and if you are active enough, you might get people stealing through your profile and clicking your blog link(s) if made available in your Facebook about page. This was so helpful, thank you!